I have an intel 82579V gigabit ethernet adaptor built into my motherboard, and it supports 'teaming' - a feature that lets me use more than one ethernet adaptor together. I'm not entirely sure if its a function of the specific driver, windows 8 or both, but it seems neat. As I understand it, AFT and ALB would work on any switch - with AFT switching over if one link dies, and AFT increasing downstream speeds, Dynamic Link aggregation would work with a switch that supports IEEE802.3ad (which mine dosen't), and switch fault tolerance would work if I was on different switches. "Static Link Aggregation" needs some undefined configuration switch side, and both aggregation options should improve speeds. But what do they really do? I've tried the two obvious options - AFT and ALB, and both don't seem to work, the TEAM device created is disabled and I can't enable it. I often have to reboot to get wired network connectivity back when I try this too. 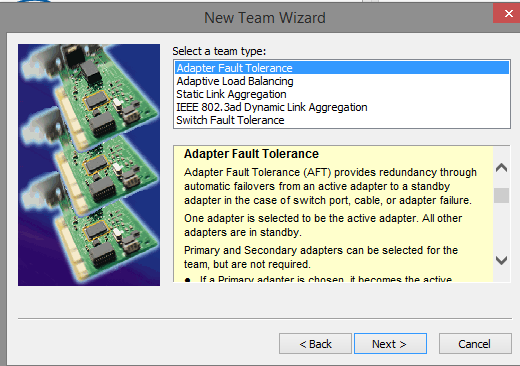 The test switch option is also greyed out, so I'm guessing its a problem with the setup. How do I determine which option to pick, and what's the practical difference between them? What do I need to look at on my switch and nic specifications when trying to pick which option to use? In general NIC Teaming under Windows from manufacturer drivers requires compatible hardware. In practice this is generally two (or more) identical NICs. Intel seems to be preferred and Realtek looked down upon. Basically your first step needs to be to install an OS that supports teaming properly and move on from there. Can you mix gigabit and 10/100 ethernet on the same network? My D-Link's Ethernet bridge downlink just got 10-30x slower? Ethernet and networking speeds as “500 Mbps Gigabit”? 10/100Mbps router overwhelmed by Gigabit switch & its devices?